Aleethia 10th Anniversary Event - Hyatt Regency Bethesda Md. Thank you to the Freedom Petals volunteers who came together on Friday, October 4th to make 42 table centerpieces for the 10th Anniversay of Friday Night Wounded Warrior Dinners. This was the first time we bought new vases, ordered fresh flowers from a wholesale flower distrubitor and supported a hotel planned event. The volunteers created wonderful centerpieces to adorn the tables. 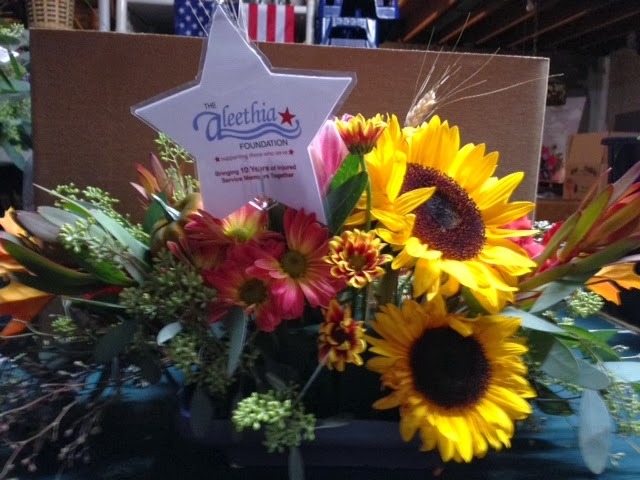 My wife and I were asked by my mother to design an Aleethia star to go in a floral centerpiece for the Aleethia dinner. We attended the dinner and helped out with getting photography release signatures during the hors d'oeuvres and drinks. My mom, the social butterfly, most likely met and spoke to everyone attending. She definitely had plenty of friends there from past flower deliveries (it's obvious she's made an impact on a lot of lives among the wounded warriors) My grandmother was also with us to help deliver and lay out the center pieces. It was both a touching and eye opening experience to be able to see and hear the stories of these injured soldiers. I'm really thankful that my wife and I were invited to this and I'm very proud of my mother for starting something that does so much good for others.